MYOSITIS OSSIFICANS TRAUMATICA OF THE MASSETER MUSCLE- review of the literature and case report. Department of Oral and Maxillofacial surgery, Faculty of Dental Medicine, Medical University Sofia, Bulgaria. Introduction: Myositis ossificans traumatica (MOT) is known mostly in the orthopedic literature as non-neoplastic, heterotopic bone formation within muscle or fascia, presumably due to acute trauma or repeated injury. Myositis ossificans traumatica of the masseter muscle is uncommon disease producing limitation of opening of the jaws. Purpose: To present a case of MOT of the masseter muscle in patient with history of facial trauma. Material and methods: The medical history of a 53 years patient with complaint of decreasing ability to open his mouth over the past 10 years after a blow to face. CT revealed enlarged calcification in the left masseter muscle. Conclusion: Treatment of MOT of the masseter muscle is surgical- total extirpation of the ossified muscle but also surgical techniques including osteotomy that involve the muscle attachment region should be considered and after that appropriate physical therapy. Deliverska EG. Myositis ossificans traumatica of the masseter muscle- review of the literature and case report. J of IMAB. 2013 Jul-Dec;19(4):411-414. doi: 10.5272/jimab.2013194.411. 11.Woolgar JA, Bieme JC, Triantafyllou A. Myositis ossiticans traumatica of the stemocleidomastoid muscle presenting as cervical lymph-node metastasis. 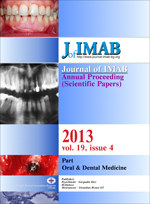 Int J Oral Maxillofac Surg. 1995 Apr;24(2):170-3. [PubMed].